After Lyra-a princess incapable of speech or sound-is cast out of her kingdom of daylight by her wicked aunt, a witch saves her life, steals her memories, and raises her in an enchanted forest ... disguised as a boy known only as Stain. Meanwhile, in a rival kingdom, the prince o... read full description below. 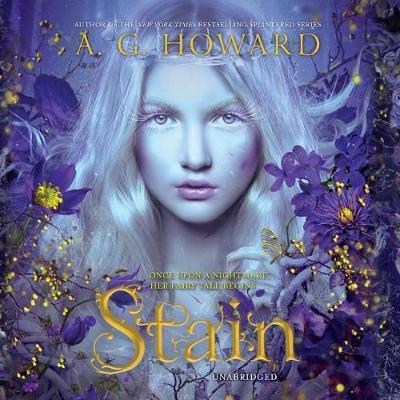 A. G. Howard is the #1 New York Times bestselling author of RoseBlood and the Splintered series. She wrote Splintered while working at a school library, having always wondered what would've happened had the subtle creepiness of Alice's Adventures in Wonderland taken center stage. She lives in Amarillo, Texas. Tim Bruce has a warm, friendly, characterful voice and works extensively in voice-over, cartoons, and audiobooks. A regular on the BBC, Tim was the voice of Channel 996 for over three years. A long list of audiobook recordings includes the award-winning Blade series, Mark Billingham's DI Tom Thorne series, Doctor Who, the Oxford Book of War Poetry, and the poetry of William Blake. Tim has also created a whole host of cartoon character voices for CBBC, Nickelodeon, Disney, and Cartoon Network.